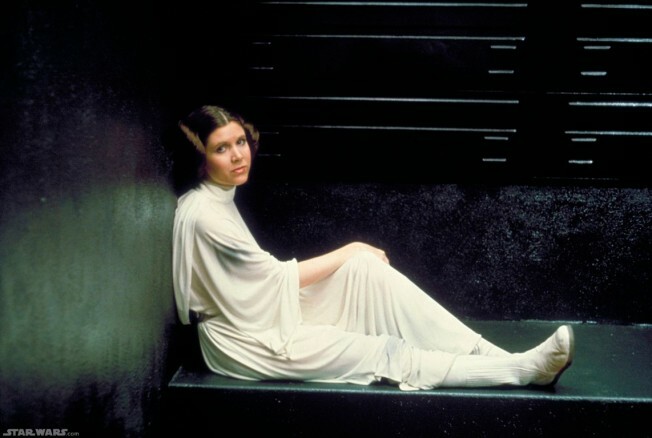 Though much older in real life, Carrie Fisher technically played Portman's daughter, Princess Leia Organa, in the original Star Wars trilogy. Carrie Fisher's hit stage production "Wishful Drinking" is heading to HBO this December as a feature-length documentary. The stage show that forms the basis of the film is made up of headlines and history from Carrie's life, which she has humorously been sharing with audiences since 2006, and was taped for the cable network on June 25. Among the topics covered in the project include the headline-spawning break-up of her parents in the late 1950's, when her dad, singer Eddie Fisher, left her mother, America's screen sweetheart Debbie Reynolds, for Elizabeth Taylor, Carrie's infamous "Star Wars" bun hairdo and her struggles with mental health issues. "A lot of the stuff I talk about, when the things happened at the time, I was too ashamed to talk about. So there's a great relief in being able to just own this and have it be something that happened and that I learned from and wasn't defeated by," Carrie told journalists at the Television Critics Association Summer Session on Saturday. "If I can do that — and some of the stuff was really hard — then anybody can [do it]." Carrie, who also turned the stage show into her 2008 best-selling memoir of the same name, said one of the reasons she first wanted to share the stories and address the headlines was to put her stamp on them. "What I realized was, when I got sober, overdosed, went to a mental hospital, all these things, it went in the paper. And my thing was, 'Well, wait a second, if it's gonna be out there, please let my version be in it,'" she said. "Also, there is the saying, 'You're only as sick as your secrets. '… If you can claim it, it has very little power over you." The author and actress said her mother Debbie – who was interviewed for the HBO documentary – saw the stage show and enjoyed seeing her daughter in that type of forum. "My mom is like any mother. She's actually glad that I'm doing this kind of show 'cause she thinks it's kind of like a nightclub, so I can finally understand her. My rebellion all my life was not doing a nightclub act. Not drugs, all that other stuff was fine, but the nightclub act thing, she's happy about that," Carrie explained. When asked if she thinks her mother is over the Eddie-Liz scandal, which created a firestorm of headlines and derailed her father's career, Carrie said she is. "God, I hope so. It is 51 or 52 years ago. Yeah, oh absolutely she does. She has a joke she says, which is, 'The last time I saw him, he went out to get some cigarettes and he hasn't come back since and, I said, 'Where did you go? Down the Nile?'' It's not like she's oblivious to the humor in the situation." As for her own armor for scandals, Carrie said she too has moved on from a number of hard times in her past. "I'm at a place in my life where, having gone through a lot of the things that I've gone through, I now feel not invincible, but not 'vincible,'" she said.